Communities thrive when people can move around easily. 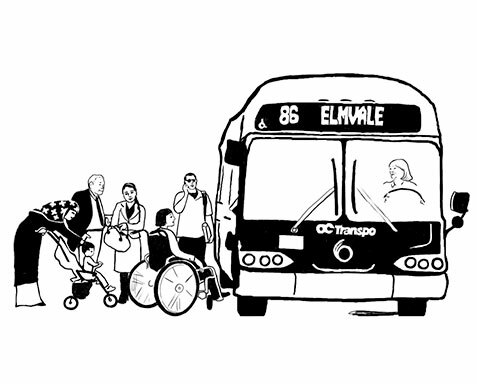 OC Transpo provides an especially critical link for those who have limited choices—including the young, elderly, people with disabilities and lower-income Ottawans. When everyone has access to safe, affordable transit, it contributes to Ottawa’s social wellbeing and economic prosperity. No one should have to pass up going to the doctor or visiting a friend because they can’t afford to travel within Ottawa. Our public transit system should empower those who have limited choices—including youth, elderly, people with a disability, and lower income Ottawa residents. Without consistent federal funding for transit, cities can’t afford to have good transit that is affordable for everyone. Rising bus fares make it challenging for people on low incomes to afford public transit. Will you establish a long-term (10-20 year) National Transit Strategy with funding commitments made to municipalities for each year so they can make public transit more affordable for riders? Will you commit to regular meetings with provincial and municipal governments to plan and implement public transportation solutions?